We have a Dell Powervault 745N running Windows 2003 standard, SP1. We have generated and installed an SSL certificate from rapidssl (geotrust) in IIS and it works ok. However, upon reboot, when we check the IIS certificate settings in the virtual directory, we can see that IIS is once again using the old, machine certificate. ... No error messages in the event log. ... The IIS metabase is working ok otherwise - does not appear to be corrupt as other settings I change seem to stay as part of the config. The first step is to verify that the correct SSL certificate information is actually being persisted into the IIS metabase. To do that, we look at the website's properties in the metabase, particularly the SSLHash property, as shown below. Inside MMC.exe click File - Add/Remote Snapin. add the Certificates snapin and point it to the Computer account when prompted. Expand the Personal - Certificates nodes and locate the certificate that you want IIS to use (the certificates should be listed by their common name so you should be able to locate the one you want easily). 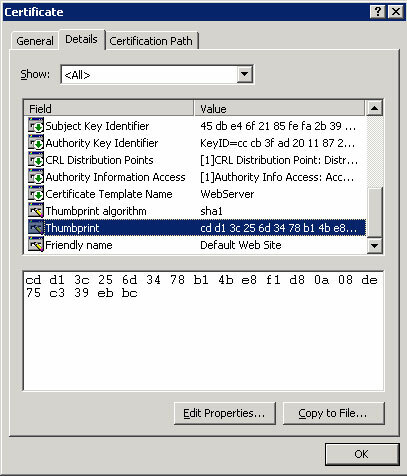 Double-click the certificate to bring up its properties, and on the details tab scroll down to the thumbprint property. Verify that the value for the thumbprint is the same as the SSLHash stored in the metabase. If it is, then you know that IIS is currently configured (both in-memory, and in the metabase) to use the correct certificate. Since the correct certificate has been persisted to the metabase, the change in certificate must be caused by some external agent. The next step is to enable Metabase Auditing. This enables us to see what process or user account is making changes to the metabase, what they are changing, and the old and new values. Detailed steps on enabling metabase auditing are available here. A quick search turns up the following MSDN documentation on TaskCord. The Task Coordinator stores it's jobs in the registry at HKLM\SOFTWARE\Microsoft\ServerAppliance\ApplianceManager\ObjectManagers\Microsoft_SA_Task. Under the ApplianceInitializationTask key there was a task called SelfSignCert.SelfSignCert.1, which was run each time the box was booted. That task was causing a self-signed certificate to be generated and applied to the default website each time the box was booted. Removing that entry stopped the SSL certificate from being changed. Case closed! On a completely unrelated note, I graduated with a Masters of Business and Technology (MBT) from the University of New South Wales last Friday (24th). Bruce mentioned that IIS didn't appear to support the use of commas in filenames when configuring redirects in IIS. If the URL you are redirecting to contains commas, then any part of the URL following the comma is ignored. Mentioned on Splatt's blog, is this service that attempts to measure the influence of your blog. Curious, I checked it out. Apparently my score is/was 8065. I also checked out a few other blogs. Frank Arrigo scores 11145. David Wang scores 2382. Frankly I don't think that my blog is 3x more influential than David's. And it can't be only a few thousand points short of Frank's. So something needs to be tweaked in the formula - my blog influence is waaaay overstated. On the other hand, Raymond Chen scores 97615 and Jensen Harris scores 17774 so no surprises there. As Aristotle pointed out in the discussion, it’s quite possible for a server to return a 404 or 500 HTTP status code, and IE (or any other browser) to render any provided HTML. Webservers have been serving custom 404 or 500 error pages for a long time now. 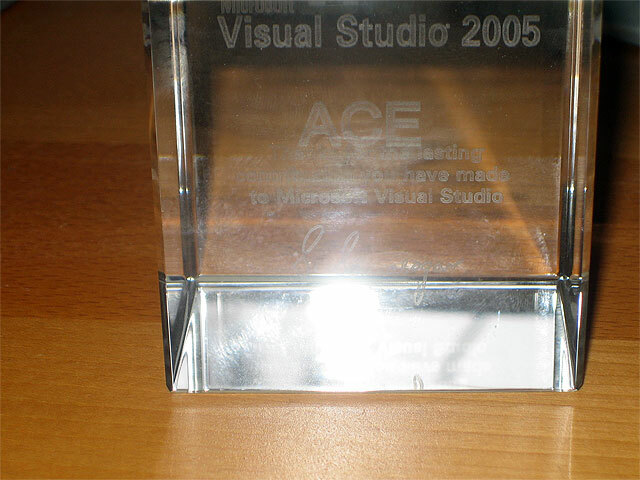 To add to Jonno’s experiment, I would like to tender Microsoft KB article 218155. This details the behavior of IE when seeing certain HTTP status codes, and friendly HTTP errors are turned on. If the HTTP body is less than a certain amount, then IE will substitute a "friendly" error page for certain codes. If the HTTP body is more than a certain amount, then IE will render the HTML sent by the server. Presumably this helps novice users who might otherwise be intimidated by a server that sets a HTTP status (e.g. 404), but provides nothing else. The default threshold values are stored in: HKLM\Software\Microsoft\Internet Explorer\Main\ErrorThresholds and user specific overrides can be stored in a corresponding key under the HKCU hive. Origami/UMPC - anyone else disappointed? Some people seem to love them. I'm wondering if anyone's disappointed? Don't get me wrong, I love mobility. I have two tablet PCs (Tecra M4, Portege M200), three pocket PCs (two iPaqs and a Toshiba) and four smartphones (Qtek and iMate) in my flat, along with three regular notebooks (Lat D600, Tecra M2 and Vaio Z1). Three hour battery life is disappointing. If Microsoft wants this to be a disconnected device then we need at least a day's worth of power. There's no point taking this outside, on holidays, or wherever if it needs to be charged every 2-3 hours. The screen resolution is way too low. Imagine trying to do anything productive in Excel or Visio on an 800x480 screen. The device doesn't have any features that mitigate the current problems with mobile devices in the enterprise: employees lose these things, or they get stolen, or they get damaged, or they get infected with spyware/malware when used at home. The devices aren't exactly ergonomic. 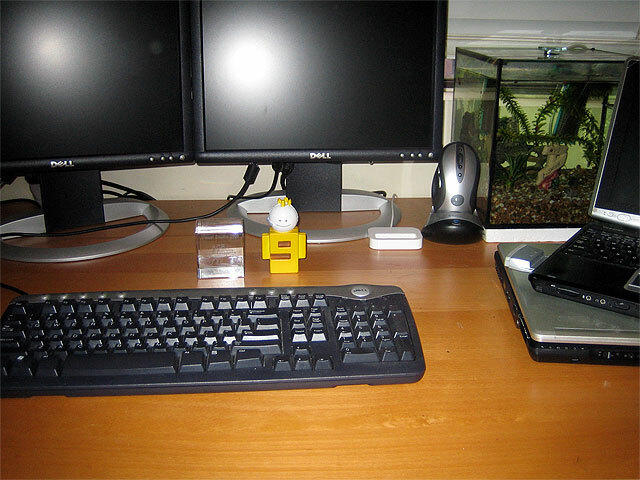 People who use computers daily need proper keyboards, mouses and a decent sized display. This device offers none of that. And lastly, the devices look ugly. I know Jeff disagrees with me, but I think Jeff needs to buy some stuff some made by Apple or Sony. Whilst a low price might overcome these limitations, the talked about costs (US$500-1000) probably means I'll be sticking to my regular Tablet PC + iMate Smartphone + iPod Nano combination. What do you want in an IIS 7.0 book? A few friends and I have been in discussions with a publisher about a book on IIS 7.0. On the weekend, we handed over the latest draft proposal. We already think we have a number of things that will make this book the book to have on IIs 7.0 - it'll cover everything that most other books do and then some, and it'll be written by people who have real-world experience running large scale IIS facilities. But we really want to ensure that this is the best book on IIS 7.0 out there, so we'd like to hear from you about what you'd like to see in a book on IIS 7.0 - what types of things would make you get hold of such a book? Mike Kolitz (Virtualization Team) has instructions on installing Vista into a VPC. To get VPC Additions working you need to use the Virtual Server 2005 R2 Additions (well, those are the only pubicly available ones that work). You can get the Virtual Server 2005 R2 additions from the trial edition if you don't have access any other way. Why can you only have a single password policy in a domain? Many IT Admins and consultants who profess themselves to be AD-competent will tell you that multiple password requirements is a reason to have multiple domains within your Active Directory (AD) forest. You simply can't have multiple password polices in the same domain. And attempting to link GPOs that specify differing password polices to different containers (e.g. different OUs for users) doesn't work. However I've found a lot don't seem to know why this is the case. Maybe it's a question they've never turned their minds to, or maybe they don't know as much about AD as they think they do. I'm sure it's the former, though some of my less charitable colleagues argue that it's the latter (big grin). Password polices, like any other policy setting, apply to a client (be that a computer/machine, a user, or both). So who or what is the client in this case? Despite what many think, it's not the user. And that's the reason you can't have different policies for different users. The clients in this case are the Domain Controllers in your domain.